This article was also published here. This article was published here, too. 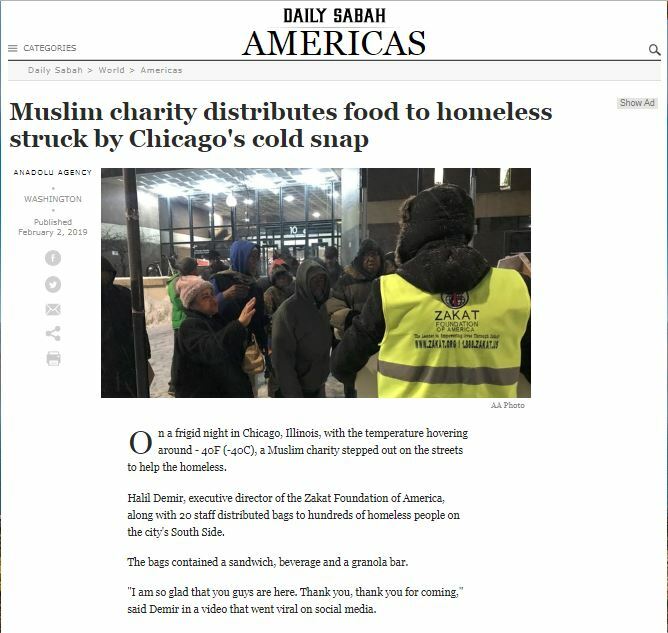 On a frigid night in Chicago, Illinois, with the temperature hovering around – 40F (-40C), a 59-year-old Turkish-American Muslim man stepped out on the streets to help the homeless. Halil Demir, executive director of the Zakat Foundation of America, along with 20 of its staff distributed bags Wednesday to hundreds of homeless people on the city’s South Side. They contained a sandwich, beverage and a granola bar. “I am so glad that you guys are here. Thank you, thank you for coming,” said Demir in a video that went viral on social media. Blankets, coats, gloves, socks, hats and adult diapers were also among the aid handed out to the needy on the streets. Demir said the foundation delivered food to 10 police stations as well as homeless shelters in the brutal weather when many shops were closed. “We have no worldly expectations. It is the duty of a Muslim to help hungry and homeless people, regardless of their views or religion,” he told Anadolu Agency. Demir, originally from Sanliurfa province in southeastern Turkey, has been living in the United States for 20 years. “In this country, where Muslims are a minority and anti-Islamism is increasing, such activities are becoming more important,” he said. Demir described a heart-warming experience when he and his staff were on their way to the foundation’s Chicago headquarters and made an unplanned stop at a library. The moment he stepped in, Demir said he saw a lady librarian scanning a list of phone numbers on her table. “She was overjoyed,” said Demir when he told her they were from an aid organization and asked whether she needed anything. The lady, named Alvira, was searching for an institution to help a dozen homeless people who were sheltering in the library before it was time to close. She said there wasn’t even food to offer them. “God sent you. I know God sent you for us,” said Alvira, according to Demir, who said he was “indescribably moved” by the experience. Demir and his friends brought them to the foundation’s headquarters and are providing them accommodation and meeting all their needs until the weather warms up. Founded in 2001, the Zakat Foundation of America is a Muslim-run charity organization and helps needy communities at home and abroad.